They say you can learn a lot about a person just by looking at their desk. Ever wonder where VE comes up with all this nonesense? What's his office look like? Many have asked, all have been ignored...until now. These pictures are large so if you click on them you can see a lot more detail. 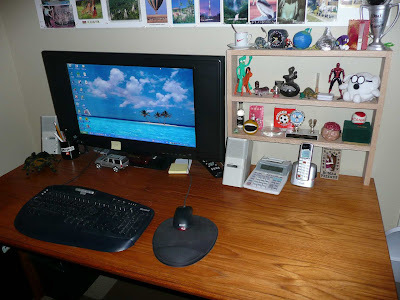 Here is VE's desk where he creates all his nonsensical posts. Yes, that is a 28 inch TV for a monitor. I've said it all along...size DOES matter. VE also picks up currency and other ridiculous do-dads he is given over the years. Now...having spied a portion of my office man-cave, what conclusions have you derived? Size does matter... But not with computer monitors. Ack! You're a clean freak! That room was WAY too clean! AND....not sign of the gnomes! I like that fuzzy white ball with black glasses. Will you be giving it away in a blog giveaway? Perhaps you could give it to the commenter who consistently stays in FOURTH place on your blogroll. Yep, size does matter, especially when it come to a giant Hershey's Kiss. Yummy! 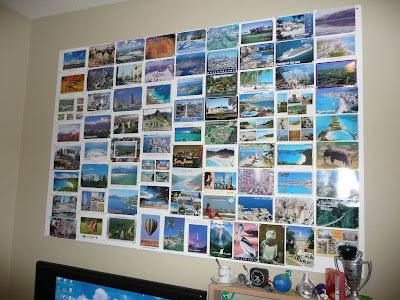 Nice postcard collection - I have one too. Conclusion? You are very well-traveled. You are also a pack rat – but an extremely neat & organized one. And I spied the ball with the word “Canada” which made me smile! "He's a very clean man, isn't he?" Well Ed...I now have you're full name and address. Not to mention that you think that Gumby rides Pokey. me-me king - I see you spied my oversized Hersheys kiss! I know...be jealous. Did you see my executive slinky in its special box under the Canada ball? I know...be jealous. beth - That Canada ball came from Toronto too! Yep, been there three times. perpetual - Ha! Good observations. I was going to remove that but seeing as how I don't work, there's no employer who cares about my blog now anyway. I want your job, whatever it is so I can travel as much as you do! You are also very organized! You Are Tidy.I am shamed & must now spend the rest of the weekend cleaning Up! it's remarkably organized and orderly. my work desk is orderly but my home desk is an perpetual avalanche waiting to happen. 1. Stop being so neat, or I'm going to have to come over there and rough the place up. 3. On the map picture, there's a row of currency with faces on it... the fourth guy over looks like Grady from Sanford & Son. 4. You've never been to Michigan?? 5. My favorite postcard is the one in the far left side, three up from the bottom. All that blue and green! Where is it? 7. There is a giant Hershey kiss on the top shelf below the postcards. I wonder how long it's been there and if it's still edible. 8. Speaking of things being ED-ible, I found your first and last name.... according to Perp-Choc, your address is there somewhere too, but I don't see it. What a pity. It would make the stalking go so much easier. Yeah, look look mighty neat to me, too. Did you clean just before the pictures? So am I the only one impressed with the "Grill Award". You know how I love my smoker, although with my shoulder surgery this summer I never got to use it. The only bad thing with me not using it, hubby has now discovered it and is laying claim to it. He now says it is "his" smoker. That is just not right on so many levels. That smoker was my territory for many years and he thinks he is taking it over. But the good news is that he still hasn't totally figured out how to use it properly. Next spring and summer it will be mine again. So congrats on getting that award from your kids. Although I think you need a smoker too. "Once you have smoked there is no going gas." Oh and I see you have never made it to Panama. You really need to go there someday just to see the canal and how the locks work. Plus you are just too clean. Ugh, how can you find anything in all that cleanliness. Just toss everything in a big box and then dump or toss it around the room and there you go. The recipe for a great office. You will then be able to find whatever you want. Unorganized clutter is the ticket. I don't see a pin in Australia. It surprizes me you haven't been there yet. You are a well traveled indivdual. 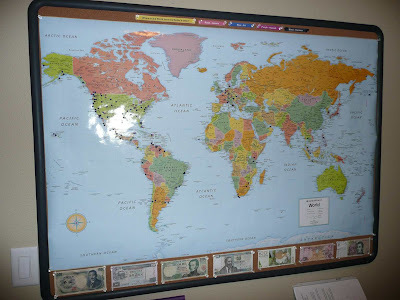 My world map would look mighty blank compared to yours but at least I got you beat on the computer monitor!!! OCD, Dude, OCD. I'll throw in a bit of ADD for fun. That was fun. More photos please! I just used your map to show my daughter where Australia is. See, that was a very educational post! Sadly I've found out that your just normal and not the weirdo I thought. Shucks! But hey anyone with a pokey and gumby toy is cool in my book! Wow you are rich what with all that foreign currency! Are you really a Nigerian Prince? Seriously - are you me? Or my long lost brother perhaps? bonnie - There's the trick...I don't have one! mrsupole - I'm proud of my grill master award. The other award on the shelf was for a 1st place in a Duathlon (that's running, biking). No, I haven't been to Panama or Columbia. I've been to Costa Rica and Ecuador and Venezuela so I've been above and below it though. "8. I think Perp Choc is merely referring that she can now get my address...I don't see it anywhere either"
Oh, excellent; she's absolutely right! Thanks to the magic of the Internet, I've narrowed it down to two addresses. Hopefully by next month you should start getting shipments in the mail. What are stalkers supposed to send, anyway? Horse heads? Cookies? Tickets to Preakness? Dingo parts? Baskets of cheese and sausage? I hope it's not expensive or time-consuming. I'm kind of lazy. Maybe I'll just send a postcard from Michigan so you can put it on your board and pretend you've been there. Would I still get my stalker merit badge for that? nursemyra - Makes me sad too! you are a master of disguises with the CIA!!!! anne - If you don't do anything, there's no mess to accumulate! jessie - Yes, it's true that they pay me to stay away from them...I like that kind of corporate sponsorship! Huh... it looks like you can't go anywhere new. Your postcard board is all filled up! I conclude that we are WAY too much alike! 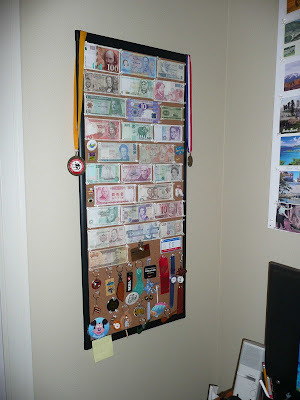 I collect postcards, foreign currency, keychains and other trinkets. However, we are not alike when it comes to desk cleaning. Mine is a wreck! I can't believe how neat your desk is. How do you manage that? go sailing on a yacht or something for a year so you can put lots of pins in the oceans--or you could just dip your toe in it--isn't there a saying that if you step in a river you have stepped in all rivers or something? anon - William! I should have known! Yeah...I didn't know what to do with it so I made a little shelf on my home desk. You know you're the first person I actually know that's commented on my blog other than bloggers?